The traveling bag, which was originally made from carpet, is also known as the carpet bag purse. The Disney character Mary Poppins carried this accessory as her magical traveling bag. Once made for travel purposes, the carpet bag purse has crossed over into the fashion industry. The accessory is designed in a variety of sizes, with large side and bottom panels. Draft your bag's pattern on pattern paper with your ruler. For a basic traveling bag, measure 14 inches width by 14 inches in height. Your bag will have a square shape. These specifications includes your side seams and can be used for your shell as well as lining. If you have selected a clasp-purse frame, make your patterns accordingly to accommodate the frame's dimensions. Draft your bottom panel's pattern. Measure 14 inches in width by 7 inches in depth. Measure your side panels 8 inches in width by 14 inches in height. Use a ruler for your patterns and a French curve ruler to shape the bottom corners (optional). Cut out your patterns with your paper scissors. Pin your patterns onto your fabric with your straight pins. Cut out your bag's shell and lining fabric parts with your fabric scissors. You will have two outer shell and lining pieces, two side panel shell and lining pieces, and one bottom shell and lining piece. Pin your pattern pieces to your interfacing and cut it out. Although this step is optional, the interfacing will ensure that your carpet bag purse retains it's shape and body. Pin your outer shell together. The wrong sides of your fabric will be facing out. If you are working with interfacing, attach it to the outer shell with a hand-sewn basting stitch prior to pinning. Pin your lining pieces together. You will have two separate pinned purses. Machine stitch your outer shell and inner shell separately. Turn your outer shell inside out. The right side of the fabric will be facing out. Do not turn your lining inside out. Insert the lining into the carpet bag's outer shell. You will have clean seams when you open your bag. Make sure your outer shell and lining's raw edges are aligned, which will impact the fit of your pieces into your purse frame. Stitch across the purse's raw top edge, leaving a 3/4-inch seam allowance. Insert the stitched seams into the frame. Each frame has a different attachment process. Read your frame's instructions and tutorial diagrams prior to attaching. If you are working with a brass zipper, turn in the raw edges. Pin your zipper's taping in between the shell and lining layers. 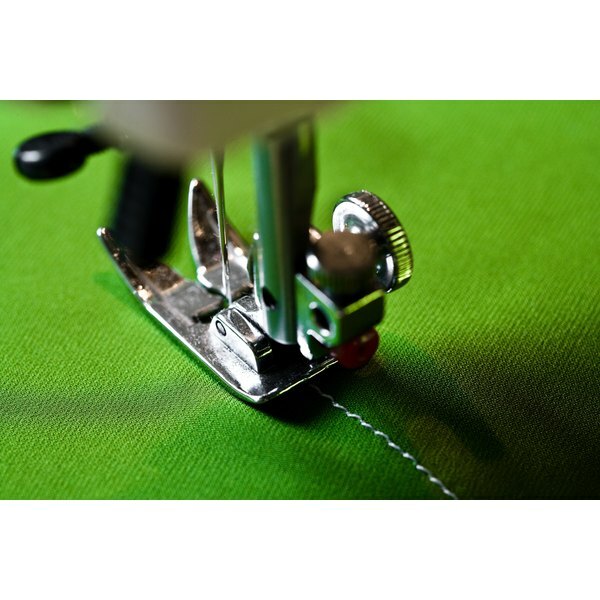 Change your sewing machine's straight stitch foot to a zipper foot and stitch the zipper in place. Top stitch all around the outer rim of your bottom side panel. This added step will ensure that your bag retains the bottom's shape. If desired, top stitch at the side seams to ensure the bag remains rigid and does not collapse. Check the ends of your bag's handles to determine how to attach the handles to the bag. If your handles have a metal bar opening, stitch a separate fabric loop for the bar, then stitch the fabric to the purse. If your handles have square fabric end tabs, stitch them directly onto the shell prior to inserting your lining (step six). Cut away all loose threads from your completed carpet bag purse. Fabric options include lightweight canvas, printed pinwale or a solid six-wale corduroy. You can also choose different fabric types to make a patchwork inspired carpet bag purse. Select a decorative printed lining or a solid taffeta. Coordinate your bag's outer shell fabric with your trim selection such as novelty handles, brass zipper or a decorative clasp purse frame. Position your trims onto the pinned parts carefully. For example, check that your pinned purse fits correctly into your clasp purse frame. Make any necessary attachment markings with your tailor's chalk onto your fabric.